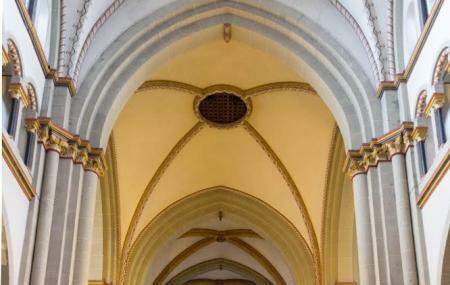 Find hotel near Munsterbasilika St. Marti ..
Bonn is home to some of the most fascinating Romanesque churches in Europe. The MünsterBasilika St. Martin is a pristine attraction in the city that houses hidden secrets of the 2nd century Roman art and religion. It is often considered as the first Roman church to install a classical organ inside its walls. Built in the 12th century for the patrons of the church, St. Martin Basilica continues to be the seat of the Theban Legion. It is also a part of Beethoven’s life. The composer gave organ and choir lessons in this church. The museum is often referred to as the Basilica of St Martin. The choir area is a restricted passage. The organs installed in the church are restored to their former glory. Do try your luck in playing a few tunes. It’s a revered place for most. Maintain the sanctity. Mass days and weekends often get crowded due to visits by pilgrims. Use of mobile phones, tablets and music players are strictly restricted. How popular is Munsterbasilika St. Martin? People normally club together Wildpark Venusberg and Botanische Garten Der Friedrich-wilhelms-universitat Bonn while planning their visit to Munsterbasilika St. Martin.